• Breakfast, lunch and dinner in the Buffet Restaurant "Mallorca"
• Dinner in the Spanish buffet restaurant "Don Quijote"
* A reservation is required for the speciality restaurants. A dress code applies. ** These services are available in the Aquaworld marina, 5 mins from the hotel. Transport is not included. 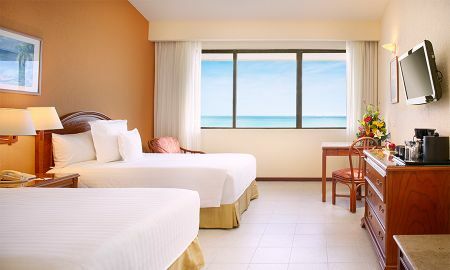 Situated on a pretty beach in the Mexican Caribbean, the Occidental Tucancún hotel is an ideal place to enjoy your holidays in magnificent surroundings. This 4-star hotel has 334 inviting rooms affording décor with hints of Mexican culture and marvellous views overlooking the sea. The Occidental Tucancún hotel also offers its guests the Barceló All Inclusive programme so that you won?t need to worry about anything during your stay. The hotel has 4 restaurants serving a wide variety of Mexican, Spanish and international dishes. If you want to enjoy a drink, you can do so in one of the hotel?s 5 bars. Visit the spa at the Occidental Tucancún and enjoy the variety of treatments that will make you feel refreshed. In addition to this, there are many activities, marvelous swimming pools and the opportunity to try out water sports that will guarantee you a perfect stay. The Occidental Tucancún hotel is situated on the Caribbean beaches, just 20 minutes from Cancun International Airport and the city centre. Next to the hotel is the Kukulkan Plaza shopping centre and 5 minutes walk away is La Isla shopping centre; the newest in Cancun. The 3% of City Tax is already included in the rates. 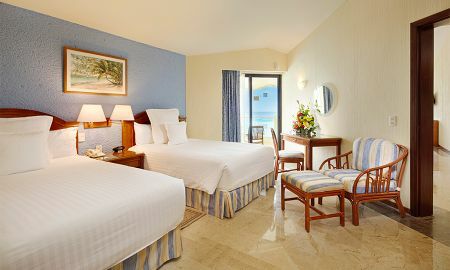 Environmental sanitation tax $25.35 Mexican Pesos per room per night (not included in rates).